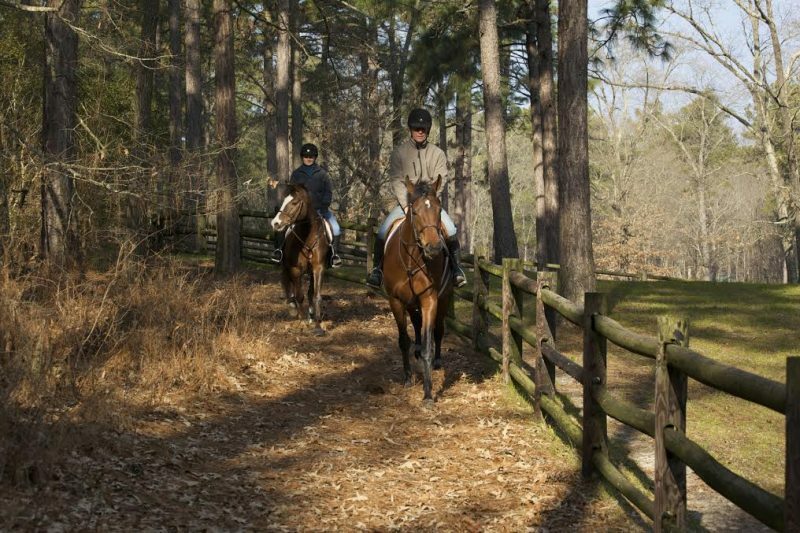 In the town of Southern Pines, equestrians have a treasure to be envied and emulated. The Walthour-Moss Foundation (W-MF) is a 4,000 acre natural treasure for equestrians and the entire Carolina Sandhills community. While the original focus was for horse use, the preservation activities created a truly significant nature preserve that has endured while “progress” continued in the surrounding area. Progress consisted of the typical community sprawl including factories, shopping malls, sub-divisions and the roads required to support population growth. It was in the early 1970s that Ginnie and Pappy Moss took the initial steps to realize a vision of a large tract of land preserved for equestrian activities. Through a series of gifts and estate commitments over a period of thirty years, they assembled the 2,500 acre core of the Walthour-Moss Foundation. This sanctuary for equestrians and nature lovers alike has grown to a total of 4,000+ acres through a multi-phased land acquisition campaign in the 1980s and 1990s, and additional land donations from members of the community. The Mosses helped to develop a culture where horses and equestrianism were a part of the community. A critical component of that culture included an unwritten rule that allowed horseback riders to cross private property to access the Foundation lands. It is not uncommon for community members to traverse five or six farms from their home stable to enter the Foundation and connect with nearly 600 miles of bridle trails and carriage paths, while those from farther away access the Foundation from designated horse trailer parking areas. In the early 2000s, members of the Walthour-Moss Foundation board of directors began to see an alarming trend, one which threatened the community culture including its horse-friendly nature. The threat revealed itself through acts of denied access and division of existing farms. Loss of the ability to cross a neighbor’s land was symptomatic of a growing community with increasing land prices, sub-division of farms, and new residents who were unaware or failed to understand the culture that had developed over 30+ years. The very fabric of Southern Pines horse country was endangered. The W-MF Board of Directors decided their best course of action was to protect the access that had been heretofore understood in order to preserve the core – The Walthour Moss Foundation and the community’s equestrian culture. The Foundation accomplished this through the development and execution of a strategic plan for the organization which addressed the threat and other issues of concern. They knew they needed to broaden their base of support to include members outside of the equestrian community. Another important goal was building an emotional attachment to the Foundation, its natural resources and recreational opportunities; and to protect the horse-friendly culture and physical access for riders and drivers to the Foundation lands. A central component to the strategic plan, approved by the board of directors in 2007, included a campaign to secure perpetual trail access easements to the Foundation. They began by seeking to protect the access directly adjacent to Foundation lands. In order to secure the access easements, the Foundation began sharing its plan with community members by gathering small neighborhood groups over cocktails and hors d’oeuvres. The events were hosted in private homes. At the event, a presentation was made by Foundation leaders which included sharing the Mosses’ story and legacy gift to community, the natural assets of the Foundation lands, and the special nature of the preserve and community culture that had developed around it. There was a brief review of overview maps including trails, a simple description of the access easement project goals, and a brief description of how the access easements worked. From visiting with community members at such events, the Foundation leaders were able to develop a feel for who might be interested in placing an easement. Once they had identified 10 or more interested parties, those individuals were approached to participate in a follow-up gathering to learn more details about the access easement project and process. s for the land owner as the Foundation encouraged easements on the outer edges of the properties. A special effort was made to secure easements from road and home owners associations in order to replace easily changed by-laws into perpetual access agreements. In two and a half years, the Foundation secured access easements on 10-miles of trail. With each easement placed, they made sure to celebrate the success with the land owner and the community. The celebration included placing a bronze plaque at the easement site. A key component of the project’s success was the neighbor to neighbor encouragement led by those who had already participated and emphasizing the ease of participating in the process. 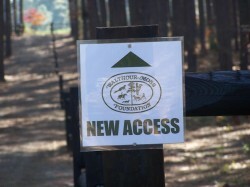 For the Southern Pines equestrian community that so enjoys the unique opportunities provided by the Mosses foresight and the existence of the Foundation, their ability to protect the access linkages is preserving the larger trail network, keeping the equestrian nature of the community intact. disallows blocking the trail with a gate, fence or landscaping.